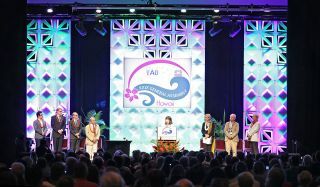 The International Astronomical Union is holding its General Assembly meeting in Honolulu, Hawaii, where the group will announce the names of 32 well-studied exoplanets and 15 host stars. The general public were invited to vote on the names. HONOLULU — The votes are in! Thirty-two exoplanets will get new names that were chosen in an open vote by the general public. The naming announcement will come next Tuesday (Aug. 11) at an international meeting of astronomers. The "Name the Exoworlds" campaign, created by the International Astronomical Union (IAU), gave the public the opportunity to vote on new names for stars and planets in 20 exoplanet systems. The results of the campaign will be announced on Aug. 11 at the IAU's 29th General Assembly meeting here in Honolulu, Hawaii. When planets and stars are discovered, they are automatically given names that are often very technical-sounding, such as the star HD 149026 and its planet HD 149026b (which will both be given new names on Aug. 11). The contest will give "common" names to 32 exoplanets and 15 of those planets' 20 host stars. (Five of the host stars already have common names.) Proposed names for HD 149026 include Jiyaiantobaba, Opuntia and Ogmios. The complete list of systems and proposed names can be found here. Members of the astronomy community can also submit proposals to the IAU to rename stars, planets and other space objects, but this is rarely practical because there are so many objects. In an effort to get the public excited about astronomy, the IAU decided to get people involved in naming some of the most interesting exoplanet systems ever discovered. The 20 exoplanet systems selected for the contest were all discovered before 2008, and have been studied extensively (this ensures that scientists have confirmed that these objects are, in fact, exoplanets). Organizations and clubs were invited to submit proposals for new names, which were then listed online in ballot form. The general public was then invited to vote for their favorite monikers. The IAU is an international organization of astronomers and space scientists, with over 10,000 members worldwide. The IAU has authority to officially name objects in the universe. So, for example, the IAU will have to ratify the "unofficial" names that have been given to the newly discovered features on Pluto's surface by the scientists working on NASA's New Horizons mission. A representative of the IAU said the group is eagerly awaiting naming proposals from the New Horizons team. It was also the IAU that decided on an official definition of a planet, and demoted Pluto to dwarf-planet status in 2006. The IAU will announce the new planet and star names at a press conference on Aug. 11. Stay tuned to Space.com to hear the winning names.